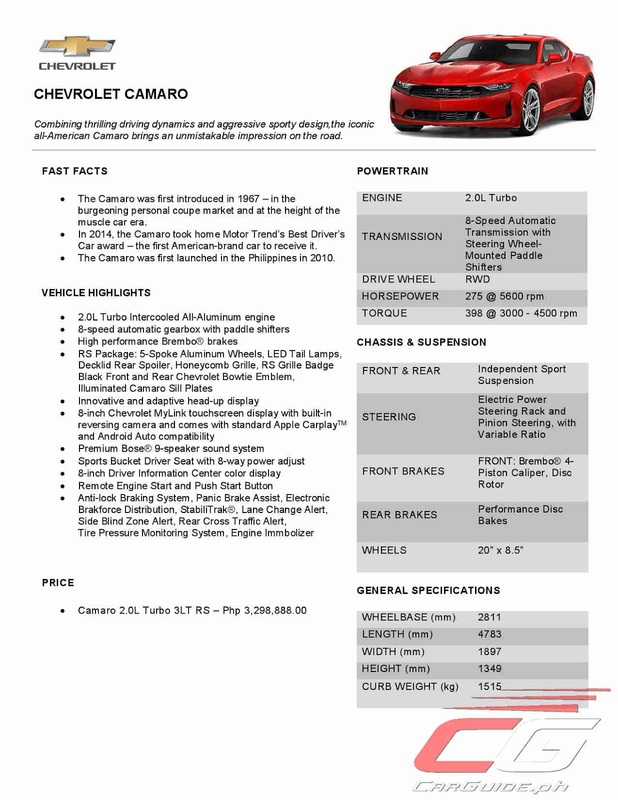 The latest Camaro RS offering from Chevrolet Philippines is powered by a 2.0-liter DOHC VVT direct injection turbo engine that delivers 275 horsepower and 398 Nm of torque. 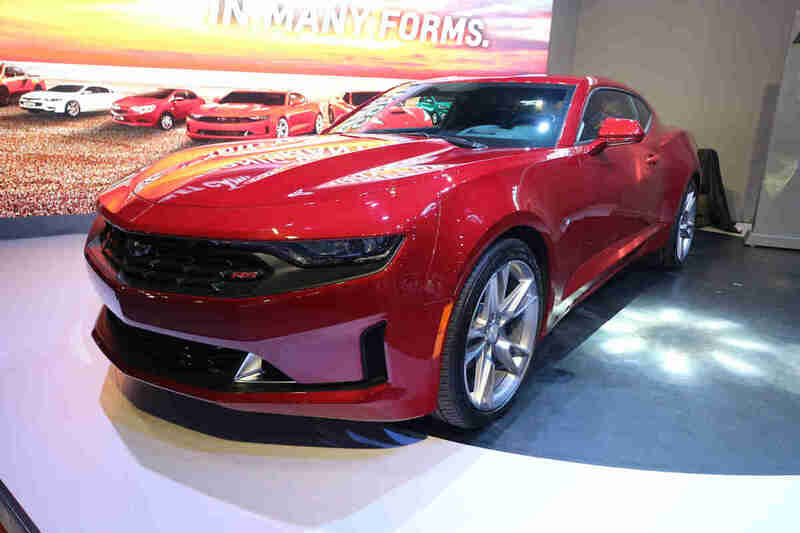 Coupled with an 8-speed paddle-shift automatic transmission, the Camaro inspires a responsive and efficient everyday drive on the freeway. The Camaro is fitted with high performance Brembo brakes featuring 4-piston calipers, promising track enthusiasts with serious stopping power while maintaining street drivability. Inside, the sixth generation muscle car features a refined cockpit optimized for performance driving with a leather-wrapped flat-bottom steering wheel, black leather interior panel, and custom leather-trimmed dashboard and console. The driver sport buckets memory seat features an 8-way power adjust and ventilated with cooling and heating, while the passenger sport buckets seat features a 6-way power adjust with cooling and heating ventilation. The Camaro offers premium and intuitive technologies that complete one’s driving experience. Slated with an 8-inch touchscreen display featuring the latest Chevrolet MyLink Infotainment System with Apple CarPlay and Android Auto compatibility, the vehicle allows for hand-free access information, entertainment, and phone connectivity. The Camaro is fitted with premium Bose 9-speaker sound system to further elevate the driving experience inside the vehicle. The Camaro makes road safety a top priority. The American muscle car is packed with a host of advanced safety technologies including ABS with EBD, stability control, Lane Change Alert, Side Blind Zone Alert, Rear Cross Traffic Alert, Tire Pressure Monitoring System (TPMS), Engine Immobilizer, Rear Parking Sensors, and built-in Reversing Camera. The Camaro also comes with a special Chevrolet warranty of five years or 100,000 kms., whichever comes first. 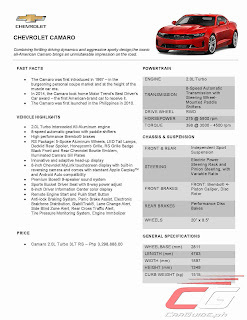 The Chevrolet Camaro 2.0L Turbo 3LT RS is now available at P 3,298,888.00.